This article is about the 2009 film. For the 2000 Showtime film, see Seventeen Again. Not to be confused with 18 Again!. In 1989, 17-year-old Mike O'Donnell (Zac Efron) learns during the start of his high school championship basketball game that his girlfriend Scarlet Porter (Allison Miller) is pregnant. Moments after the game begins, he leaves the game and goes after Scarlet, abandoning his hopes of going to college and becoming a professional basketball player. Nearly twenty years later, Mike (Matthew Perry), now 37 years old, finds his life stalled. Scarlet (Leslie Mann), now his wife and mother of their two children, has separated from him, forcing him to move in with his geeky, yet extremely wealthy, best friend, Ned Gold (Thomas Lennon). He has quit his job after he is passed over for a promotion he deserves in favor of a younger female co-worker simply for being too old, and his high school-age children, 17-year-old Maggie (Michelle Trachtenberg) and 16-year-old Alex (Sterling Knight) want nothing to do with him. Later, while driving, an encounter on a bridge with the janitor (Brian Doyle-Murray) transforms Mike back into his 17-year-old self. After convincing Ned of his identity, Ned believes that Mike's transformation was caused by a mystical spirit guide who is trying to steer him on a better path. Mike enrolls in high school posing as Mark Gold, Ned's son, and plans to go to college on a basketball scholarship. As he befriends his bullied son and discovers that his daughter has a boyfriend, Stan (Hunter Parrish), who does not respect her and frequently torments Alex, Mike comes to believe that his mission is to help them. Through their children, Mike spends time with Scarlet, who notes his remarkable resemblance to her husband, but rationalizes it as an odd coincidence. Deciding to also try and fix his relationship with Scarlet, Mike begins to finish (under the pretense of getting "volunteer credit") all of the garden projects he abandoned as an adult. He does his best to separate Stan and Maggie while also encouraging Alex to be more confident so he can make the basketball team and go out with a girl he has a crush on named Nicole. Mike has difficulty resisting his desire for Scarlet despite the relationship's clear inappropriateness. Ned, meanwhile, begins to pursue the school's principal Jane through increasingly extravagant stunts in order to win her affections, which she adamantly rebukes. After Mike and Alex help win a basketball game, Mike throws a party at Ned's house while he is out on a date with Jane. When Scarlet arrives to reprimand her children for attending a party, Mike shows her that Alex has finally managed to get together with his crush, leading Mike and Scarlet to have an intimate conversation where Mike accidentally tries to kiss her. Disgusted, she storms off as Mike tries unsuccessfully to explain his true identity. On the day of the court hearing to finalize Scarlet and Mike's divorce, Mike makes one last attempt to win her back (as Mark) by reading a supposed letter from Mike. He states that although he couldn't set things right in the beginning of his life, it doesn't change the fact that he still loves her. After he exits, Scarlet notices that the "letter" is actually the directions to the courtroom and she begins to grow curious. As a result, she postpones the divorce by a month. Frustrated that he could not salvage his marriage, Mike decides to once again pursue a scholarship and move on with a new life. During a high school basketball game, Mike reveals himself to Scarlet. As Scarlet runs away, Mike decides to chase her down, just like he did in 1989, but not before handing the ball off to his son. Mike is then transformed back into his 37-year-old self, and reunites with Scarlet. As Mike prepares for his first day as the new coach at his children's school, Ned, who has successfully started a relationship with Jane, gifts him a whistle, both happy with their new starts in life. Matthew Perry/Zac Efron as Mike O'Donnell: Perry portrays Mike at age 37, while Efron portrays Mike at age 17 in the opening flashback to 1989 and after Mike has undergone his magical transformation. Leslie Mann/Allison Miller as Scarlet Porter-O'Donnell: Mike's wife and the mother of his children. Mann plays Scarlet as an adult and Miller plays the teenaged Scarlet in the opening scene. Michelle Trachtenberg as Maggie O'Donnell: Mike and Scarlet's daughter. Hunter Parrish as Stan: Maggie's aggressive boyfriend. Sterling Knight as Alexander O'Donnell: Mike and Scarlet's son. Thomas Lennon/Tyler Steelman as Ned Gold: Mike's best friend. Lennon plays the adult Ned, while Steelman portrays Ned in the opening flashback. Melora Hardin as Principal Jane Masterson: principal of the high school that Maggie, Alex and the rejuvenated Mike attend. She is also Ned's love interest. Jim Gaffigan as Coach Murphy: the high school basketball coach who has been there for at least 20 years. Kat Graham, Tiya Sircar and Melissa Ordway as Jamie, Samantha and Lauren: the three girls who continually try to impress Mike. Josie Loren as Nicole: the head cheerleader and Alex's crush. Brian Doyle-Murray as The Janitor: the magical figure or guardian angel who makes the transformation possible. The film received mixed reviews. Review aggregation website Rotten Tomatoes gives the film a rating of 56%, based on 145 reviews, with an average rating of 5.4/10. The site's consensus reads, "Though it uses a well-worn formula, 17 Again has just enough Zac Efron charm to result in a harmless, pleasurable teen comedy." On Metacritic, the film has a score of 48 out of 100, based on 27 critics, indicating "mixed or average reviews". Roger Ebert gave the film 3 stars out of 4. The film was predicted to take in around $20 million in its opening weekend. Opening in 3,255 theaters in the United States and Canada, the film grossed $23,722,310 ranking #1 at the box office, with 70% of the audience consisting of young females. By the end of its run, 17 Again grossed $64,167,069 in North America and $72,100,407 internationally, totaling $136,267,476 worldwide. 17 Again: Original Motion Picture Soundtrack was released on April 21, 2009, by New Line Records. The orchestral score was written by Rolfe Kent and orchestrated by Tony Blondal. It was recorded at Skywalker Sound. ^ Fritz, Ben (April 17, 2009). "'17 Again' is No. 1 at weekend box office". Los Angeles Times. Retrieved 2013-01-20. ^ "17 Again (2009)". Box Office Mojo. Retrieved 2011-04-23. ^ "17 Again Reviews, Ratings, Credits, and More". Metacritic. CBS. 2009-04-17. Retrieved 2012-09-15. ^ Ebert, Roger (April 15, 2009). "17 Again Movie Review & Film Summary". Chicago Sun-Times. Retrieved June 13, 2014. ^ Fritz, Ben (2009-04-17). 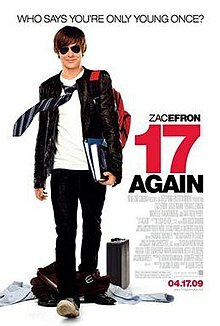 "Zac Efron and '17 Again' expected to rule box office". Los Angeles Times. ^ McClintock, Pamela (April 19, 2009). "'17 Again' tops weekend box office". Variety. Retrieved June 13, 2014. ^ "17 Again (2009) - Box Office Mojo". www.boxofficemojo.com. ^ "17 Again: Original Motion Picture Soundtrack". Amazon.com. Archived from the original on 20 April 2009. Retrieved 2009-04-22.